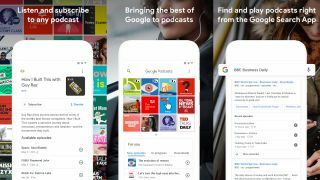 Google has launched a new podcast app for Android, designed to find shows you'll like and fire them down your auditory nerve. The practically-named Google Podcasts monitors your listening habits and uses its recommendation algorithms to suggest new material. Podcasts have been available through Google Play Music for years, but this is the company's first attempt at a dedicated mobile app since Google Listen, which it killed off in 2012. Google Podcasts works much like other podcast apps, letting you find and download shows for later listening. Google says more than 2 million podcasts are available through the app right now, including "all the ones you've heard of" (and many more, clearly). You can subscribe to any show that takes your fancy, and find new ones directly through Google Search. Podcasts are synced across devices, so you can start listening to a podcast on your phone on the train, and continue on a Google Home speaker in the kitchen without losing your place. Google is planning several AI-powered updates in the near future, including closed captions for podcasts so you can 'listen' even in noisy environments. This will presumably use the same technology as YouTube's automatic captioning. The company also wants to make podcasting more diverse. "Looking at top charts, only about a quarter of the most popular podcasts tend to be hosted by women, and even fewer by people of color," said Google Podcasts product manager Zack Reneau-Wedeen. To that end, the company is setting up a creator program to help people from underrepresented groups get themselves heard. If you're interested in getting involved, you can sign up and pitch your ideas. Two million podcasts is a good starting point, but there's room for plenty more.